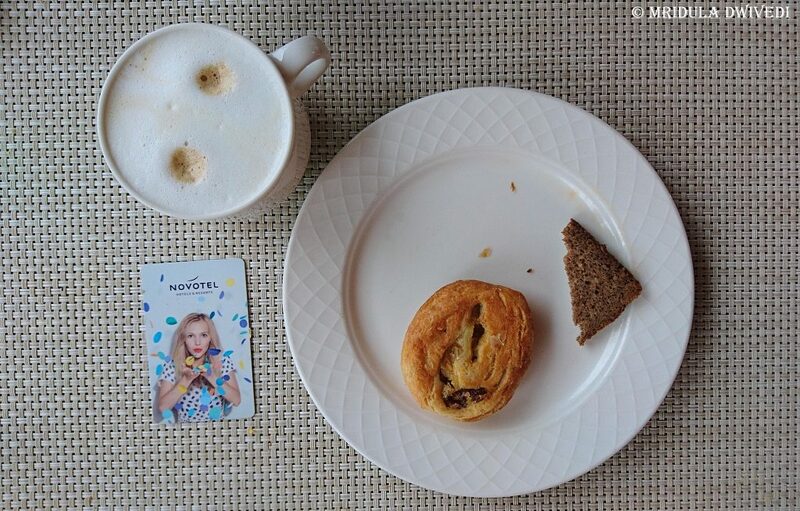 While I was looking for a hotel in Budapest I started with Accor Hotels. I have stayed with them in the past, both as a guest and as a hosted blogger. I quite like them, I know what to expect and they have never disappointed me. Also, they have a great range, right from Ibis Budget to Raffles and Fairmont. My quest ended up with booking Novotel Budapest Danube. Accor has many properties in Budapest. Sofitel was out of my budget so it was quickly ruled out. I had to choose between two Novotels, Ibis Styles and Mercure. 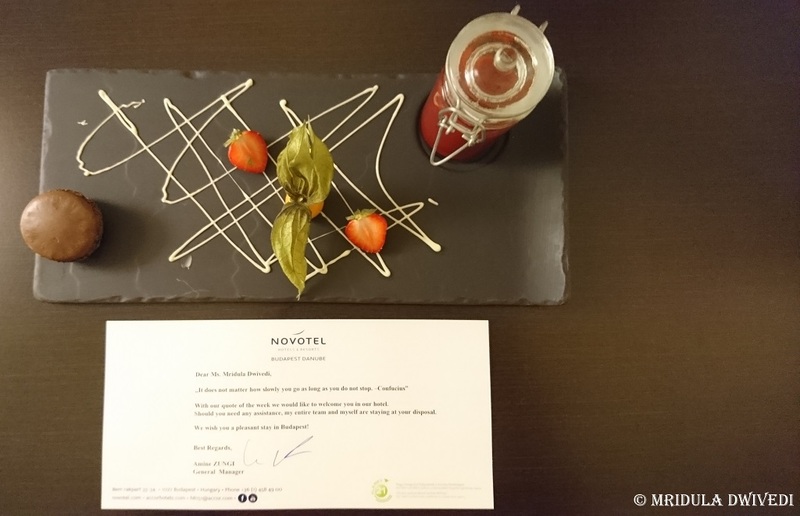 In the end I went with Novotel Budapest Danube because I loved the pictures I saw on the website. I said to myself, “I may not get the view of the parliament from the room but I will surely get it from somewhere.” My only doubt was what if the view was not representative? But I got what I saw in the pictures and more. 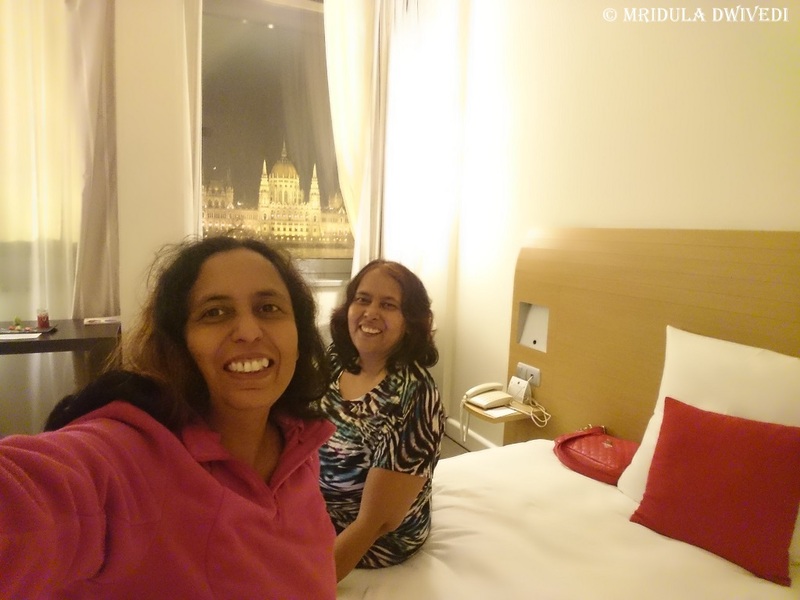 My sister and I thoroughly enjoyed our stay at Novotel Budapest Danube. To get my relationship with the hotel clear, I paid for my stay and other major expanses. I did get in touch with the good folks at the hotel before I went. I was given a nice room with a view. Other than a late check out and the nice view, I paid for everything else. In return I did an Instagram takeover for stories on their handle during my stay. I signed up with Le Club Accor. I got a few emails about my stay before I arrived. One of it was about online check-in. It is a great thing, do make use of it. I entered all the relevant information online. So, when I arrived at the hotel, they just needed a signature or two and my credit card to hold some amount on it! My check-in was a breeze and we needed it. We were really tired after our long journey from Delhi to Budapest with a halt in Rome. We asked for twin beds and we got it without any mistake. We had a great view of the parliament building from our room. We stayed in 338, it has a great view. On the first day, my sister and I could not take our eyes off it! When we would do Whatsapp calls home, she would show the view to everyone, I did the same. The room with the view made our stay truly memorable! We had good sleep throughout our stay. The room was made up without fail! The bathroom was clean and the accessories fair trade. There was tea in the room. But my sister and I are big on tea. So, we carried a bit of milk powder and Indian style ginger tea sachets. It was a great idea. On our next trip together, we will carry more, as we ran out of ginger tea! I did not book the breakfast with the room. On the first day my sister and I in our great enthusiasm went out for breakfast. From the second day, till our last, we took every breakfast in the hotel. They have a large spread and plenty for vegetarians. My sister used to like their peaches a lot. I enjoyed the yogurt, eggs, nuts and an occasional waffle! We also liked the baked beans, mushrooms and the choice of breads! All Accor Hotels to the best of knowledge subscribe to the sustainability program Planet 21. Using Fair Trade products is one part of it. Fare Trade as an organization works with farmers and workers to get them a fair deal! The usual appeal to the guests to reuse towels is there. I have participated, in a small way, with their Soap for Hope project but in Singapore. I like it a lot that they care for the environment and make a big deal of it! Novotel Budapest Danube is at an easy walking distance from Bethany Tere, a public transport hub. You can catch M2 metro line from here. There are many buses and trams available as well. 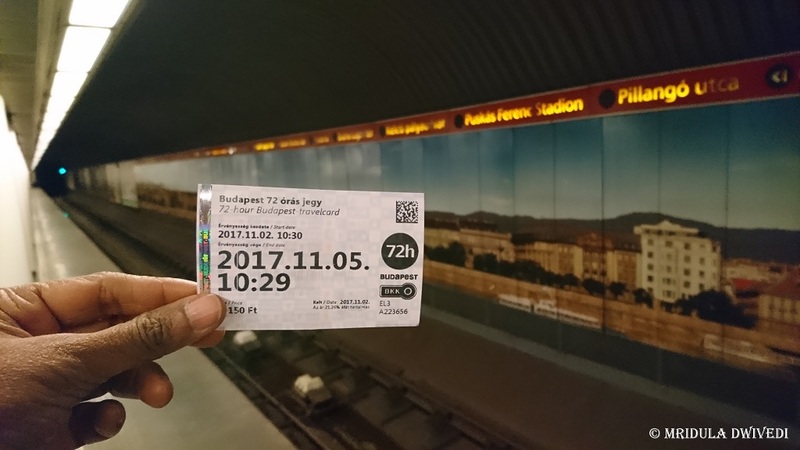 I used the metro and trams frequently to get around the city. The Blue Line of Red Bus Hop On Hop Off also stops at Bethany Tere. We bought a travel card which was valid for all public transport with a few exceptions. Right behind Bethany Tere there are many restaurants and shops. There is a Spar, a general store, from where I used to buy beers. We also did some shopping from there. We tried Edeni Vegan, Coyote Coffee and one Italian Restaurant in the square. You have more options if you hop two stops on M1 and go to Derek Ferm Tere. That takes you straight to the city center right next to the Budapest Eye. 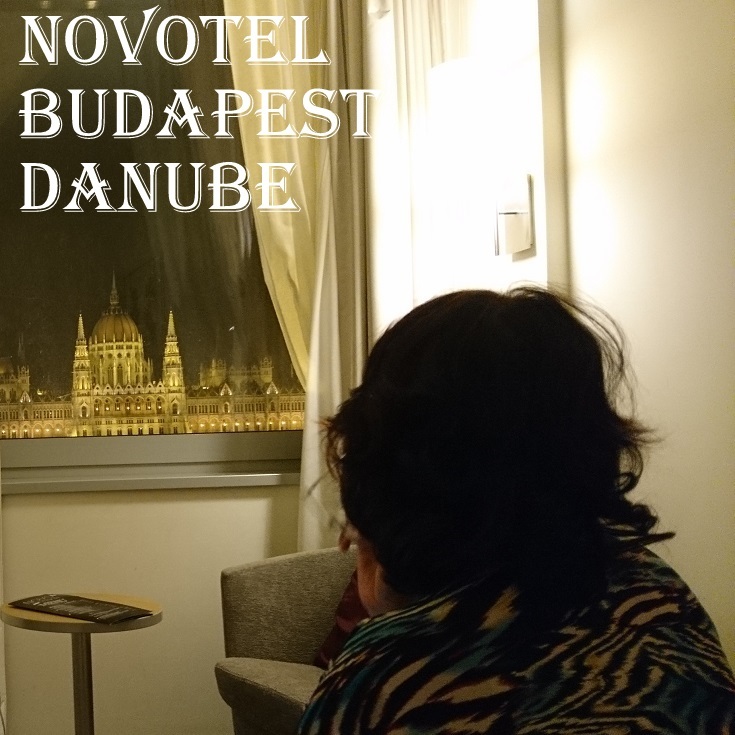 We stayed at Novotel Budapest Danube for seven nights. My sister and I would walk all around the city. It was cold in November. When we would walk through the doors of the hotel into the warmth of the lobby, we knew we were going to be comfortable and well rested! I would happily stay with them again! 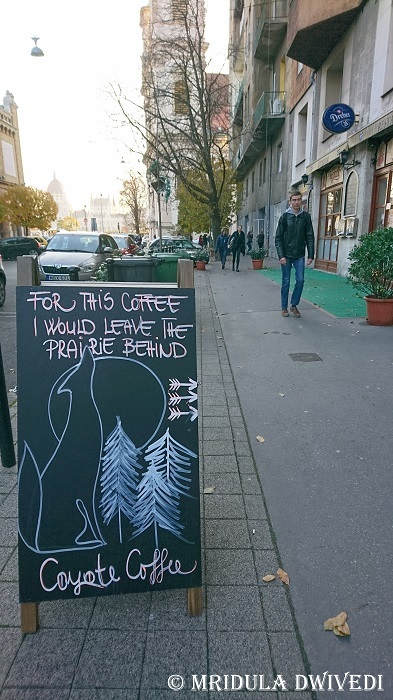 Sounds like a cool place for anyone visiting Budapest! Have made a note, for my visit as and when! Yes Ajay I liked the location too! Aha! Coyote Coffee and the room with a great view. You have refreshed all the memories again. Yes it was such a good trip! It is a good place to stay and I feel it has better views than Sofitel but then I might be biased! I love reading all those smallest details you share. It feels like I’m traveling with you 🙂 They would be great tips for someone who is new to the place. 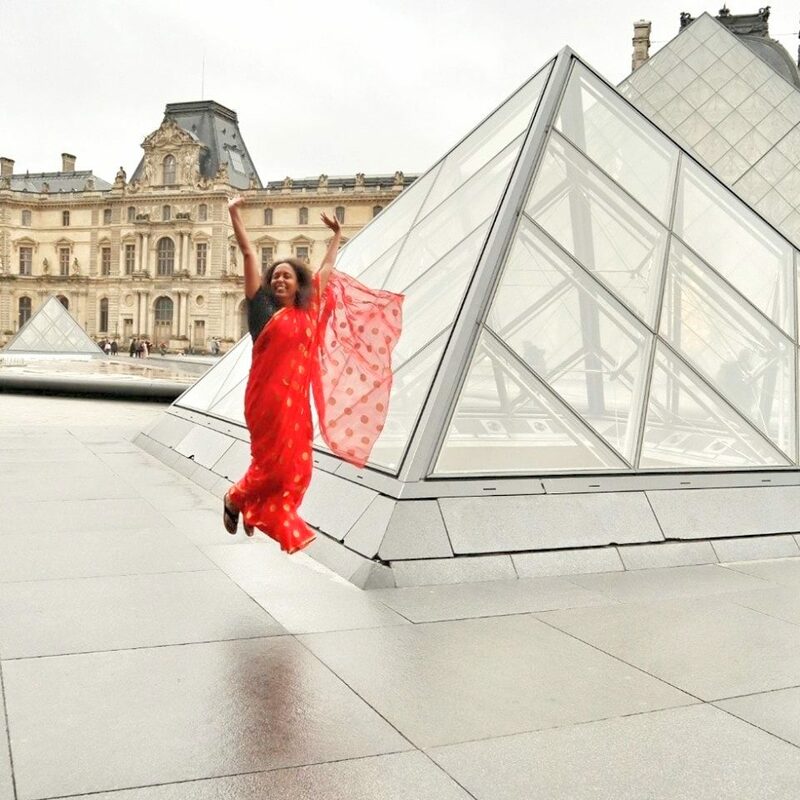 Thank you Sindhu, when I travel on my own I do get more familiar with the city! We indeed had a good time! Thank you Ravish. Me too got an idea from this post and will carry ginger tea sachet when will be on the trek . Hungary’s parliament is so famous ? ?